Rogers Corporation™ BISCO® BF-1000 is a soft, cellular silicone foam with high compressibility and durability. The material is UL certified for flame resistance without the use of added chemicals, making it an environmentally friendly alternative material. BISCO BF-1000 is available in a variety of thicknesses ranging from 1.60 millimeters to 25.40 millimeters at a density of 208kg/m3. The 1.60 millimeter thick BISCO BF-1000 cellular silicone was selected for laser testing. A diagram depicting the BISCO BF-1000 material is shown in Figure 1. Figure 1. BISCO BF-1000 diagram showing the consistent nature of the 1.60mm thick foam. BISCO BF-1000 can maintain its physical and mechanical properties over a wide range of pressures and temperatures, particularly high temperatures, making it compatible with, and a desirable material for, laser processing. The non-contact nature of laser processing provides a method of cutting BISCO BF-1000 cellular silicone without mechanically deforming the material. Universal Laser Systems makes it simple to consistently and repeatedly process this material with a high degree of dimensional accuracy, as the non-contact nature of laser processing eliminates material deformation during processing. BISCO BF-1000 cellular silicone was tested to assess laser processing compatibility and to determine the best configuration of peak laser power and wavelength. For laser cutting, BISCO BF-1000 cellular silicone absorbs 9.3µm CO2 energy more efficiently than other wavelengths, producing an edge with minimal heat effects. Utilizing a higher peak power laser allows for a faster motion system travel speed, which reduces the amount of laser dwell time while laser cutting the material, further reducing the heat-affected zone. With the configuration of 150 watts of 9.3 µm CO2 laser energy, laser cutting BISCO BF-1000 cellular silicone produces a straight and consistent edge and requires minimal post-processing. Laser cutting BISCO BF-1000 cellular silicone produces a small amount of debris that accumulates along the processed edge, which can be easily removed in post-processing with light abrasion. Due to the cellular nature of this product, the edge is not completely smooth as air pockets at the edge create a wavy contour. A microscopy image taken at 300x of the edge is shown in Figure 2. Figure 2. A top-down microscopy image (300x) of the edge after laser cutting BISCO BF-1000. 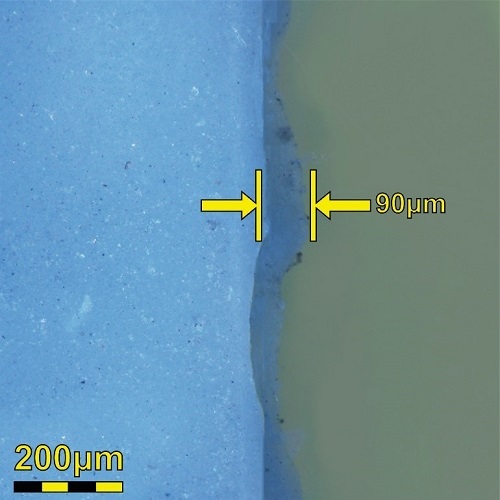 The heat-affected zone of the edge measures 90µm. BISCO BF-1000 was tested with both 9.3µm and 10.6µm laser wavelengths. The results of these tests were compared by analyzing the heat effects, quality of the processed edge, and post-processing requirements. The comparison of these two system configurations is listed in tabular form in Table 1 and shown photographically in Figure 3. 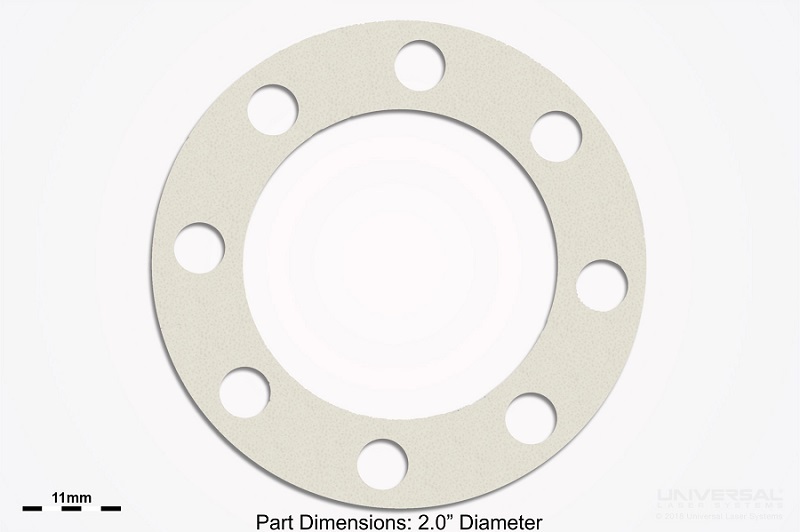 The 9.3µm configuration produces a noticeably better edge when cutting this material and is the recommended configuration. Figure 3. 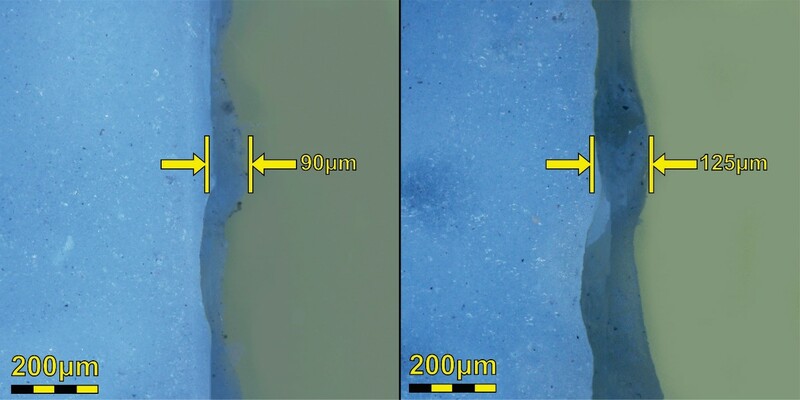 Microscopy images (300x) of the processed edge resulting from the 9.3µm (left) and 10.6µm (right) wavelengths. BISCO BF-1000 cellular silicone applications requiring fine geometry and intricate detail without degrading the physical properties of the material can be accomplished with Universal Laser Systems technology. An example demonstrating the results of laser cutting BISCO BF-1000 material is shown in Figure 4. Figure 4. Example of the geometry possible laser cutting BISCO BF-1000. BISCO BF-1000 is suitable for laser processing and was extensively tested to determine the best processing configuration. Through this testing it was determined that laser cutting is viable with this material and a 150 watt 9.3µm CO2 laser source is the recommended configuration. The BISCO BF-1000 efficiently absorbs the 9.3 µm wavelength laser energy to produce a processed edge that has minimal heat-affected zone and discoloration.